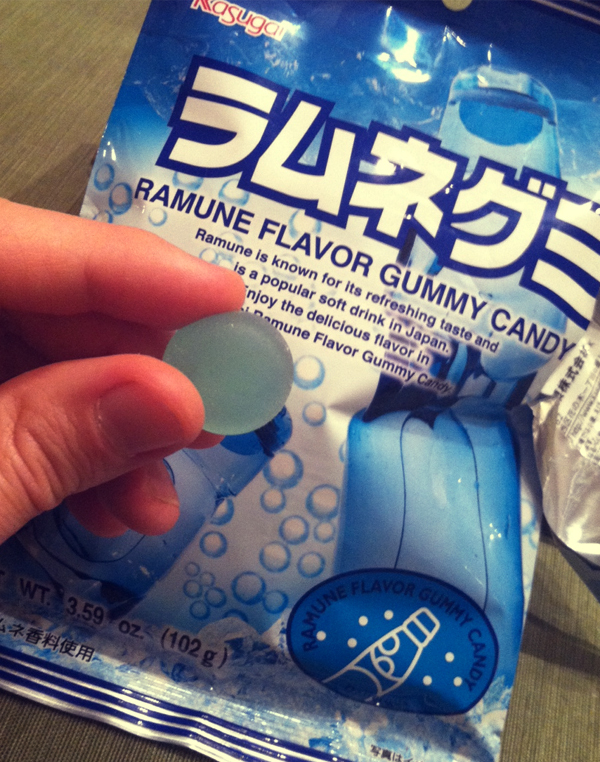 Not long ago, I was given a package of Ramune-flavored candy. The bag contains individually-wrapped cyan gummi discs, and while that may seem appealing, discs make as reasonable a shape as any for the flavor medium that is gummi. Go on. Think about it. Ramune is not unique in having been created this way, and Wikipedia has a whole list of these words — both gairaigo, Japanese words based on ones borrowed from foreign languages, and wasei-eigo, constructions using English words that are uniquely Japanese and which an English-speaker wouldn’t say. Here are twenty kickass ones, which I have chosen mostly on grounds of being the hardest to recognize as being English. By a long shot, my favorite is ronpari, just for its poetry. Also, there was one that I actually doubted: karaoke, allegedly from the Japanese kara, “empty” plus oke, originally from the English word orchestra. For some reason, it didn’t seem possible, but Etymonline backs it up. Ramune is a novelty drink for children. The bottles are designed so there's a clacking ball stuck in the neck of the bottle that slows the flow of the drink without stopping it. Kids like the sugar and the sound; parents like that it takes longer to drink. Most kids probably only get to drink it on special occasions like when the family goes out on vacation together, so the flavor has a strong nostalgic association for Japanese adults. One bit of gairaigo I remember from Osaka: "No My Car Day." It's a day of the month when drivers are encouraged to commute on the train with lower than usual fees. While I was in Japan, I met a Japanese guy who was shocked that the phrase "arafo-" aka "around forty" was not a phrase that exists in English. Also, I have a fondness for the term "skinship," because it makes so much sense but just seems to be so wrong.